Earlier today, Ubisoft shared Watch_Dogs 2 with the rest of the world with trailers and some initial details. However, a developer Q&A has been shared with the press highlighting with a lot more information on many of the game’s systems and mechanics. Even so, we’ll likely learn even more at E3 2016 – stay tuned. Q. What is Watch_Dogs 2? A: Watch_Dogs 2 is an open world action adventure game set in the San Francisco Bay Area where you play as a brilliant, young hacker, Marcus Holloway, who opposes powerful organisations that are using technology to control the masses. Marcus becomes a Hacktivist and joins a group of likeminded hackers called Dedsec. The player utilizes Marcus’ hacking skills, physical abilities, and his friends in Dedsec and fights to expose the corrupted establishment. The Watch Dogs 2 fantasy is being part of a hacker group that will expose all truths and take back control from an establishment that uses technology to take away our freedom. Q. What are the ambitions for this new game? What makes it different from the previous instalment? Answered by Jonathan Morin, Creative director A: We want to offer a vibrant and authentic world and the San Francisco Bay Area was an exciting location for us. We knew it would bring us somewhere interesting in terms of culture and tone ultimately keeping things fresh. And within this world, we want players to feel like hackers who are hacking the game to win: manipulating people for their own benefits, turning factions against each other, disrupting traffic with great control or do entire missions without even moving by just hacking remotely. For Watch_Dogs 2, the hacking culture is now the centre point of our narrative treatment. This not only opens up new ways for us to push seamless online but it also helps us to better integrate it into the game experience. Hacking is a lot more flexible since each hack offers several options making everything more analogue from a gameplay standpoint. We wanted players to explore content in a more organic manner throughout the world. And of course we are pushing for deeper hacking gameplay where players can really feel like they can think outside the box to solve their problems. We also listened to what the fans had to say following Watch_Dogs 1. The driving model has been redone almost entirely which makes it a lot more responsive and accessible. By deciding to focus on Dedsec this time around, we went for a cast of characters that were even more anchored in the hacking culture and that offer more layers regarding their motivations. Q. How is WD2 related to some of the themes relevant to today’s world? Answered by Thomas Geffroyd, Brand Content Director A: The Watch Dogs brand has been exploring data security and privacy as well as and hacking ever since the release of the first opus in 2014. We are now in a time where hackers are one of the foremost authorities to help society understand what is going on in this super complicated and technology-driven world we live in. Be it for whistleblowers like Edward Snowden, the Panama Papers, hacktivism, or pointing security flaws in our connected kids toys, hackers are oftentimes our last line of defence in a world that is becoming more and more of an opaque technocracy. As we are seeing the advent of predictive algorithm shaping our very own views of the world, algorithms that carry bias and possible real life consequences, weapon manufacturers getting into the “cyberwar and surveillance” business, and organized crime groups embracing the digital world as a new territory to conquer and benefit from, we can say without any doubts that hacking is core for understanding today’s world. Watch Dogs 2 offers a fictional environment linked to problematics players can relate to, while offering a high quality piece of entertainment as they explore the San Francisco Bay Area with Marcus Holloway. Q. Who is Marcus Holloway? What’s his story? Answered by Lucien Soulban, Senior Writer A: Marcus is a young, brilliant hacker who grew up in Oakland and experienced the injustices of the ctOS 2.0 system first hand. Now he wants to break the system wide open and give a second chance to the people who the system has wronged. He joins Dedsec, a powerful group of like-minded hackers, and comes to care deeply about his friends. His charisma and wit make him a natural leader and his fearless attitude means he’s willing to take risks to get what he wants and isn’t afraid to get into trouble. Marcus witnessed the injustices of the system first hand and he knows people’s rights and privacy are being trampled. At first it’s personal… he wants to stop the surveillance and collection of data, but after a while, it’s not just about what happened to him but what’s happening to everyone. It’s about what comes next and stopping that from happening. Q. What are the tools Marcus has at his disposal? Answered by Danny Bélanger, Game Director A: Much like in the first Watch Dogs, the player can hack into the city infrastructure, but now he has the ability to hack the AI characters, play with the city systems, send cops to arrest people, or hack any environment remote control device like forklifts and cranes to access vantage points. The player can also bring remote control devices like the RC car and flying drone and use them with creativity. We also have mass hacks to create major havoc on electric, communication or traffic systems. My personal favorite, you have the power to hack any vehicle in the game to send it spiraling out of control or block enemy pursuers. Marcus can also 3D print and wield a wide variety of weapons to suit their playstyle. From the non-lethal taser, to the powerful grenade launcher, every single player will find a weapon to suit their taste and mood. Answered by Lucien Soulban, Senior Writer A: Dedsec played a big role in taking down ctOS in Watch_Dogs 1. They are an international group of hackers with San Francisco being one of many cells, but they are independent of an organized structure and message. Their politically and socially oriented hacks are what attracted Marcus to their banner, but with Marcus, they launch into more ambitious operations that push them to the forefront of hacktivism. Q. Who are the villains and what are their motivations in the game? Answered by Lucien Soulban, Senior Writer A: Technology has become a giant spider’s web of data controlled by the highly complex Central Operating System (ctOS), controlled by Blume and its CTO. Marcus uses hacking as his ultimate weapon to rebel against the establishment which watches us, tracks us, and records us through our purchases, friends, online activity, even the words we type in our search engines. If Marcus is fighting the tools that the establishment uses, the main villains in the game are the people that are providing those tools. Q. You could choose any city in the world, why San Francisco? What does it bring to the game? Answered by Jonathan Morin, Creative Director and Mathieu Leduc, Art Director A: The San Francisco Bay Area represents the birthplace of the tech revolution. It is a hacker paradise with a specific state of mind. The San Francisco Bay Area brings something entirely fresh since it’s less about surveillance and a lot more about the new economy of information, data mining and advanced analytics. Artistically, the San Francisco Bay Area is filled with beautiful locations, amazing vistas and its culture is extremely rich. Not only does it represent the birthplace of the tech revolution, but San Francisco is influential for trends in art, music and architecture. The Bay Area’s neighborhoods and its people are as diverse as they are fascinating. Q. What are the different areas you’ll see in the game? What’s special about each one? Answered by Mathieu Leduc, Art Director A: We’ve captured the soul of the San Francisco Bay Area by dividing it into six regions: Downtown, Civic, Coast, Oakland, Marin and Silicon Valley. This means 46 neighborhoods with unique artistic signatures and distinctive aesthetic flavours. For example, Downtown is business oriented with a booming vibrant accent also defined by some construction landscapes. Silicon Valley is home of giant tech companies, large campuses and wealthy neighbourhoods. The area is mostly populated by techies, students and lots of logos. Q. What are the key hacking features in the game? Answered by Danny Belanger, Game Director and Jonathan Morin, Creative Director A: The key features in Watch_Dogs 2 include several types of hacking: Hack Infrastructure (The City), Hack AI, Hack Vehicles (Hack Every vehicle), RC Hacking (Environment and Gadgets), Mass Hacks (AI Distractions, Communications, Traffic), Network Hacking allowing you to see the world through the eyes of the hacker. You can hack every person walking around or even change their profile to manipulate them indirectly. You can get anyone arrested, distracted or even attacked. You can remote hack every car in the city to make them accelerate, steer or reverse at will. You can remote control lifts and cranes and start to be creative with physics. You can use your jumper drone to incite people and see if things will escalate. Q. Will Watch_Dogs 2 have the same online experience as Watch_Dogs 1? Answered by Dominic Guay, Senior Producer A: Watch_Dogs 2 is building on the seamless online developed in Watch_Dogs 1. Now all the online experiences of the game are seamlessly integrated with the single player: no loading, no menus, nor cuts in experience. We are improving on the best competitive experiences of Watch_Dogs 1 but also adding friendly encounters with other Dedsec hackers in the city. You can join up with those other players as a coop team to challenge the corrupted establishment together. Q. How is Watch Dogs 2’s open world different from others? 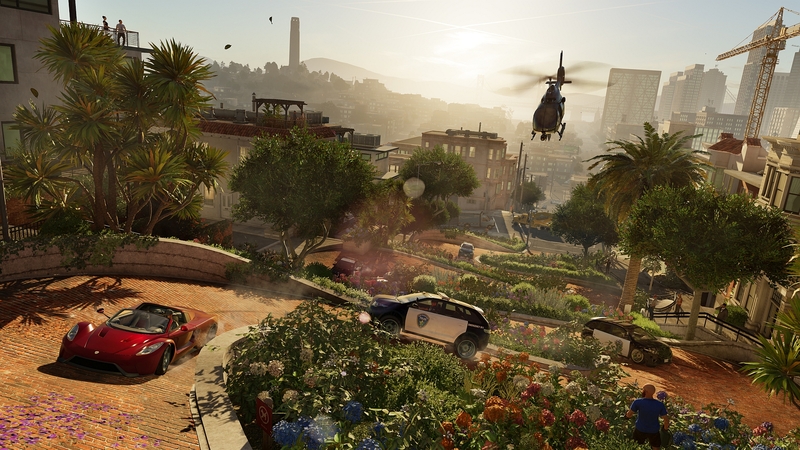 Answered by Jonathan Morin, Creative Director A: In Watch Dogs 2, players can decide how they approach each situation. They can invest on the skills and tools they want to become either the aggressor, the ghost or the trickster hacker. If they want to play without killing people they have taser weapons and drone tools to do so. If they want to turn people against each other to avoid doing the dirty work themselves they can do that too. They can also use cops to get people arrested instead of neutralizing them. Regardless of how they play, the game will not judge them, letting them decide how far Dedsec is willing to go to take back control. When they seamlessly encounter other players they can continue their fun experiments alongside them. This freedom of action is what characterizes a systemic open world. We’re building a world that has many different stories to tell. Players can interact with the world at many different levels. They can discover stories in the world and decide which kind of operations they do in order to progress. These choices will define what kind of debates are active in the world narrative. Each Dedsec operation players chose to take on will expose various issues surrounding our hyper-connected way of living. As players discover these operations and expose its secrets to the world, Dedsec will get more followers increasing the amount of people talking about them on the streets. So our world responds narratively to what is being done. They can also encounter other hackers seamlessly adding an all new layer of emergence and possibilities. In the end they get more control, more surprises and more freedom.